Will the internet make us more generous and curious? The internet and search engines have changed us. Where once our need for information was mainly linear and easily satisfied with straight answers to straight questions, we now positively need random information chucked at us, and crave esoteric answers. Our curiosity drive has become twisted and rambling like a country road with countless turns and no end in sight. There is not an information super highway, there is instead the complex network of connections between one place and another so that the map of the web would more resemble a map of the back streets of nineteenth century inner London rather than of twenty-first century New York. In truth many meanderings across the internet defy definition and are unmappable, taking us back to an earlier age of journeys when it was common for there to be some well trodden paths but many mysterious less well travelled routes. Clay Shirky’s new book Cognitive Surplus argues that the internet is returning humanity to an earlier path in other ways too. Shirky suggests that as we spend more time interacting with a wider range of contacts (via Facebook), and more time in active or collaborative pursuits online (compared to sitting alone in front of the TV) we will become more creative and more generous. How much the internet causes more generosity or how much it will enhance less attractive traits of humanity probably depends on humanity itself. As an optimist I will settle for the positive, or at least that it might be a bit less awful than the pessimists amongst us predict. Freedom of speech is written into the American Constitution, but apparently freedom to contradict your boss is less enshrined. President Obama sacked his US military commander in Afghanistan after he was reported in Rolling Stone magazine criticising the administration. Although General Stanley McChrystal apologised publically saying “it was a mistake reflecting poor judgement”, Obama has fired him anyway on the basis that as Commander in Chief he will not tolerate “division” within his team. This episode is another step along the road to disillusionment for me about the Obama administration which seemed to promise so much. Some say that McChrystal was unpopular with the administration anyway because he didn’t promise a swift end to the war which matched Obama’s hopes and his promises to the electorate. A mistake in judgement in talking to a journalist is not that hard to forgive. Journalists are notoriously cunning creatures who seduce you into saying what you really think and then go and publish it. The words “this is off the record of course” are the first you should express in most interviews. A mistake in judgement in talking to a journalist does not make you a bad war general. You shouldn’t have to always agree with your boss to keep your job. Your ability to run a war (or say negotiate a TV campaign, or plan a media schedule), should not be judged on the basis of your ability to say the right thing or agree with your boss in every case. Of course solidarity is important, but so is the ability to work through conflict and genuine disagreements. If saying the right thing is more important than excelling at your job, it is a small step to having the right connections, knowing the right people and having the right set of relatives being the overriding criteria for getting ahead. 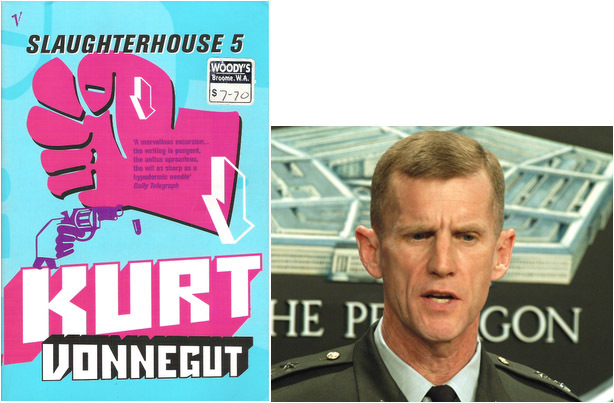 In 1968 Kurt Vonnegut wrote a brilliant novel and satire about war called Slaughterhouse 5. Its hero Billy Pilgrim comes across a story about a visitor from outer space who explains “the flaw” in the story of Christ in the New Testament. The intent of the Gospels is surely to teach people to be merciful to all people, even the lowest of the low. The problem is that Christ – who doesn’t look like much – is actually the son of the Most Powerful Being in the Universe. Readers understand this, so when they come to the crucifixion they actually think “Oh, boy – they sure picked the wrong guy to lynch that time”. The visitor from outer space gives people a new Gospel. In it the Christ figure really is nobody. And a pain in the neck to lots of better connected people. And he says exactly what he thinks. As a result he gets nailed to a cross. At which point the heavens open and God says this “From this moment on, He will punish horribly anybody who torments a bum who has no connections!”. Whoever you are you should be able to say what you think, assuming you can back it up, to your boss, without fear. 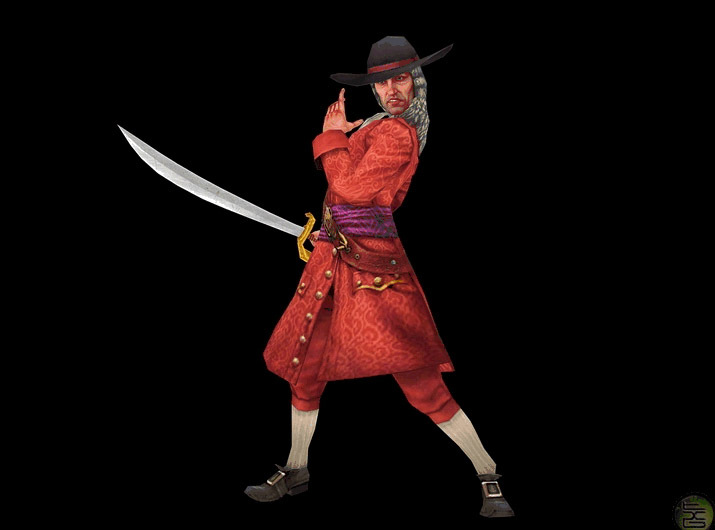 This is one of the pirate articles or rules of behaviour set down in 1720 by the famous Welsh pirate Bartholomew Roberts (pictured above). You can read more about him at ( http://en.wikipedia.org/wiki/Pirate_code#Bartholomew_Roberts.27_articles). Adam Morgan – who coined the terminology of brand challenger behaviour, uses the pirate articles as a way of building challenger behaviour in organisations in his book “The pirate inside”. The pirate articles also serve as a model for an integrated team, where integration doesn’t only improve your chances of booty but is a condition of survival. Speaking at the Big Digital Debate hosted by MediaTel earlier this month Mark Cross, communications planning director at the COI, emphasised the importance of integrated working practices and called for new ways of collaborating. “There is a shift in the hierarchy. The first port of call is not necessarily advertising”. Mark is great proponent of behavioural change theory in communications planning. And it is in this territory above all that sometimes ads must take a secondary role in influencing behaviour. If your kpi for a brief is to announce something quickly, and make the consumer an irresistible offer they can’t refuse then an ad can be hard to beat. But if you’re working in territory that demands long term shifts in attitudes and real behaviour changes then advertising may well be just one of the tools in your armoury and of course may not be the lead one by any means. Social Media, for example, is very different from a bought ad campaign in that it is not something that you can switch on and switch off. But for that very reason it can be brilliant as a tool for helping to deliver long term behavioural change. The well attended Big Digital Debate raised all kinds of interesting questions. In particular it drew attention to four areas that need shaking up. • Integrated planning processes – we need to chuck out any ways of working that assume advertising is a sine qua non of a campaign. • Integrated research – we still don’t have an easily integrated research metric that measures net ratings across media channels and increased cover build from one channel to another. • Collaborative ways of working – we probably need incentive schemes to drive collaboration between different agency partners of the client rather than settling for a situation where agencies are competing to control. • New codes of behaviour – the pirate articles admittedly need some updating. Let’s build the Communications Articles for a new era. This is all overdue really. We named this new era the Age of Dialogue some years ago now. Then it was all just starting off. Now it is mature. And the challenges for really effective communications are greater than they ever were. Is Deal or No Deal the best education? It is really difficult to learn from experience. Whether that experience is a good or a bad one, whether its personal or at work. The reason it is so hard is down to “hindsight bias”. This is the very human instinct to justify what has just happened to you (good or bad) in a way that makes sense of your world. And it is so strong that we will bend facts to fit it and create stories around them. Just watch any episode of Deal or No Deal and you can immediately see this in action. Every emotion seems to be generated in an episode of Deal or No Deal. There is greed, hope, faith, pragmatism, superstition, desire, joy and hatred. I only catch it occasionally, but I think it would be too emotionally draining to watch it every day even if I could. 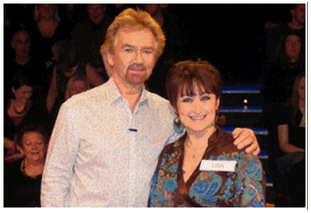 For those few people who have yet to discover it Deal or No Deal is Noel Edmonds’ reincarnation as guardian of hope and pastor of dreams. Running since 2005 in the UK on Channel 4, it runs in some format or other worldwide from Albania to Zimbabwe. The games are explained in detail at http://en.wikipedia.org/wiki/Deal_or_No_Deal or you can watch episodes at http://www.channel4.com/programmes/deal-or-no-deal. The crux of the game is that the contestant has to choose several times between taking the deal offered by the banker (a known amount of money) or the continued pursuit of an unknown but possibly much larger amount. Two things stand out as you watch the show. First that the banker uses behavioural nudges to an exemplary level in order to persuade the contestant to do a deal for their box. In one recent episode where the contestant talked about his aim being able to go on a dream holiday to Greece, the Banker offered the holiday as well as a sum of money to close the deal. 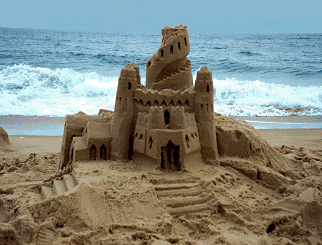 And the contestant caved in, faced with a concrete holiday as an offer rather than just money. Second in every episode the person playing the game creates a narrative that justifies the outcome. At the outset of the show, every contestant will assume that they might have the maximum amount within the box in front of them. They then will have some “reason” for picking out specific boxes. If the boxes run as the contestant hopes, that piece of random luck will seem like a massive achievement on the part of the contestant. When the boxes (as usual) fail to live up to their early promise the contestant with Noel Edmonds’ help, will start to come up with “reasons” for their failure. Often the other participants in the show are notionally blamed and will apologise for instance for opening high value boxes. Or it will turn out that a high value box opened will have been had the number matching the birth date of a wicked ex wife or boyfriend. Story after story is narrated at the show’s website: http://www.dealornodeal.co.uk/news/newsstory/. My dad and mum watch Deal or No Deal regularly. My mum – who loves a good story – with fascination for every human emotion is reflected. My dad – somewhat of a stoicist – with some disgust, regularly shouting at the TV, for the ridiculous way in which random events are interpreted with hindsight. Clearly the show doesn’t attract rationalists either as viewers or to participate. But if ever you need to remind yourself how easy it is in retrospect to justify chance with a story, then Deal or No Deal is the place to do it. Beware Hindsight Bias if you hope to learn from experience.